Want to buy the latest, cutting-edge, the very best in child care - baby monitor, for the safety and loving care of your baby. Looking for a great gift for newborn baby, infant, new parents, new mom, caregiver, pregnant - expecting - to-be-mom. There are two types of baby monitors in the market - audio and video. Video baby monitors relay not just the sounds but also the live video from the baby's room. Needless to say, video baby monitor gives a mother peace of mind no matter where she is within her house. 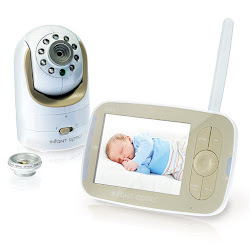 Video baby monitors consist of a camera that you place in the baby's room, and a portable LCD monitor that you either carry around like a cellphone, or place on your table - work area, or fix on the wall like a wall phone. The camera requires A/C power; the monitor uses an internal rechargeable battery. 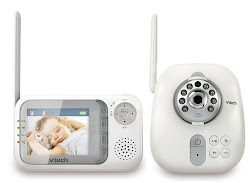 Video baby monitors dont use WiFi to work; they use a 2.4ghz signal like a common cordless phone, so they should work just about anywhere as long as the monitor is "in range" of the camera. i) Pan/Tilt/Zoom Camera - Babies move. They don't remain stationery in the cot or in the room. With a pan/tilt/zoom camera, you can remotely control the camera through your LCD monitor, and follow the baby as and where the baby moves. 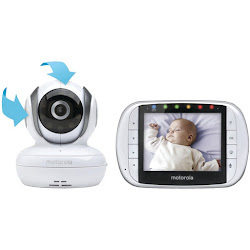 Through the monitor you can pan the room, zoom in into the baby, and tilt the camera for a better viewing angle - negating frequent trips to the baby's room to adjust the camera. 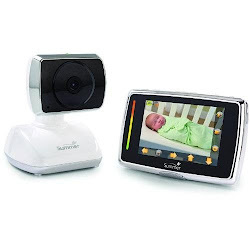 ii) Expandable up to 4 cameras - You may either go for a baby monitor unit that can only use one camera, or you may buy a baby monitor that is expandable up to 4 cameras. With expandable baby monitors, as your family grows, the expandable system continues to meet the needs of your growing family. Additional cameras allow monitoring in multiple areas, or additional viewing angles in a single room. 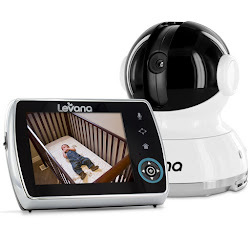 Cameras in the crib, basement, kitchen, or playroom can all be viewed from one LCD monitor for easy tracking of your children’s whereabouts. Such expandable systems either feature split screens for viewing all the 4 cameras, or they feature a scan mode which automatically cycles through the cameras at 8-12 second intervals, providing continuous video and audio surveillance on multiple cameras. Apart from these, baby monitors differ in the battery life of the LCD monitor, the sound and picture clarity, the wireless range or distance they support, the user-friendliness of the menus and buttons, and whether they provide room temperature monitor for the baby's room, remote controlled night light on the camera, in-built lullabies or soothing nature sounds for the baby, auto-power off of the monitor with sound activation, and the feature to record audio, video, and photos from the portable LCD monitor. Almost all baby monitors feature night vision, and two-way audio with a built-in speaker and microphone. I present to you a handpicked list of the best baby monitors. Check out the best gift for the new mom and the baby. - built in room temperature monitor. Pros: great price - value for money - Foscam offers you these features at the lowest price in the market; has a clear picture and sound. Cons: Foscam advertises this unit to be expandable up to 4 cameras on one LCD monitor - but Foscam doesn't sell separate cameras in the market - if you want to use more cameras, only way to get them is by buying more of these units; low battery life - a full charge lasts about 4-5 hours; the light sensor the unit uses to switch to night vision, is located on top of the camera, rather than the front - so it detects light levels from other than where the camera is looking. If you don't need more than one camera with your baby monitor, Foscam FBM3501 offers you decent performance, at a great price, with no compromise on features. Pros: good, intuitive user interface; clear picture; comes with long power chords - 10 ft power cable for the monitor and 8.5 ft cable for the camera; good battery life - a full charge lasts about 6-9 hours; good customer service. The DXR-8 offers the best user experience, amongst all baby monitors - with its longer battery life, good user interface, longer power chords, clearer picture. I highly recommend it, especially for use with more than one camera. For single camera usage the Foscam FBM3501 offers an unbeatable price advantage. Pros: has an impressive 300 degree pan - just one camera needed per room; good user interface; has a very well implemented auto-power off with VOX activation. Cons: doesnt feature room temperature sensor. Samsung SEW-3037W scores over the Motorola MBP36 with its more intuitive user interface; however the user interface is not as impressive as that of Summer Baby Touch. For single camera use, the Foscam FBM3501 - at almost half the price - offers better value for money. Pros: has 5 built in lullabies; has an accurate room temperature monitor. Cons: doesnt feature auto-power off with VOX; low battery life - a full charge lasts about 2 hours. Motorola MBP36S has room temperature sensor, and built-in lullabies; however it has an old design - there are better designed monitors in the market now, with better user interface and menus than this one. And for single camera usage the Foscam FBM3501 offers better value for money. Pros: has a touch screen interface that allows you to remotely pan, scan, and zoom, talk to baby and more - at the touch of a finger; good battery life - a full charge lasts about 8-10 hours; has clear sound; the camera has a wide angle - it shows more of a room than other monitors. Cons: doesnt feature room temperature monitor. Summer Infant Touchscreen, hands down, has the best user interface amongst all the baby monitors - this is a huge plus in its favor. For single camera use the Foscam FBM3501 offers better value for money. Pros: allows you to capture precious moments as either video or photo, through the LCD monitor; great battery life - a full charge lasts about 10-12 hours; has 3 built in lullabies; the camera has a great pan - 300 degrees horizontal and 110 degrees vertical. Cons: doesnt feature room temperature monitor; sound lacks clarity, particularly the sound from the speaker at the camera end; it doesn't come with a manual, instead comes with minimum of instructions - for any help you must visit the Levana website for support. Levana Keera 32012 comes at a very competitive price. The cost of its additional cameras is high. For single camera use I'll recommend Foscam FBM3501 over this one. Pros: good battery life - a full charge lasts about 7-8 hours; has 5 built in lullabies; has an impressive range of 1,000 feet. Cons: you can't move the camera using the parent unit; the camera has a limited swivel; smaller screen than others. VTech Communications has a great wireless range, but it doesnt have the remote pan feature - a very useful and much needed feature. Pros: features motion tracking; you can record audio, video and photos; remote connectivity capability - with a Lorex Baby Wi-Fi Cradle (sold separately)you can transmit your camera's video feed online for easy access via smartphone, tablet, and computer; instead of lullabies the unit has 5 in-built gentle sounds from nature, promoting relaxation and a sense of calm in your baby's crib. Cons: okay battery life - a full charge lasts about 3-4 hours; the buttons on the unit are close together, which leads to confusion; the night vision LEDs are the visible kind. Lorex BB3525 is jam packed with awesome features; but its been plagued with quality issues - relating to its monitor battery; and the customer service is poor. 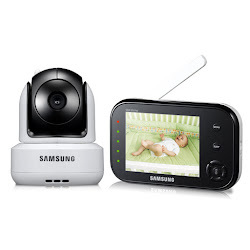 Video baby monitors are perfect for monitoring your baby, elderly parents, grandparents, home, or pets. They enable the mothers to do their daily chores in different parts of the house while keeping an eye on the baby. They reduce the stress in parenting with better loving care of the baby. Makes a great gift for baby shower, birthday, anniversary, christmas, and mothers day. Wish you great stress-free parenting, lots more sound sleep, lots of smiles, care, and love! Happy Parenting!